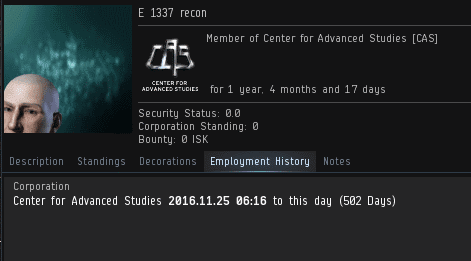 Countless thousands of EVE players belong to NPC corps like Center for Advanced Studies. Members of NPC corps share something a little mysterious. They belong to a corp chat channel with a lot of players and potentially a lot of activity. Those of us who belong to player-controlled corps might wonder: What goes on in those channels? What do they talk about all day? Good guess. Like pretty much everyone else in EVE, they spend a lot of their time thinking and talking about the mighty CODE. alliance. The New Order is particularly relevant to members of NPC corps, since so many of them spend their days in highsec. Though a lot of NPC corp members are mad at CODE. for ganking them, we do have our supporters. E 1337 recon, a member of Center for Advanced Studies, took it upon himself to defend the Code. He didn't care who judged him for it. On occasion, right-minded players will say at least a few kind words about CODE. Those are the players who "get" EVE. They have a future in the game. The rest are carebears who are likely to wash out, preferably after dropping a bunch of loot. No matter the place, no matter the situation, the Code always has an electrifying effect. It demands a reaction--and it always gets one. If you've ever wondered how new players can be indoctrinated so early in their EVE careers, NPC corp chats are part of the reason. In theory, NPC corp chats offer an opportunity for player interaction and a sense of community. In practice, the channels are too often a place where bitter old carebears infect newbies with their poison. This is terrible for player retention! The only antidote: Good people like E 1337 who speak the truth. Even speaking the truth about the Code in an NPC channel is a revolutionary act. Those who do it are worthy of the title "Agent". They always win, because the CODE always wins. Always. Unable to defeat our heroes in verbal PvP, the carebears are forced to add Agents to their "block" list. No matter. The open-minded players can still hear our Agents speak--and there's always more NPC corp Agents to carry on the crusade. Center for Advanced Studies isn't the only NPC corp, of course. 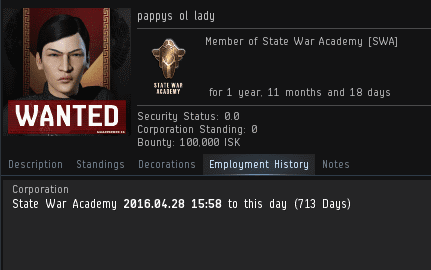 Consider how many people start EVE in State War Academy, for instance. Yes, the Code is the topic of conversation in all the NPC corp channels. And yes, our Agents are everywhere. Until the day when all highsec is compliant, the fight continues on all fronts. "The rest are carebears who are likely to wash out, preferably after dropping a bunch of loot." Never not gank loot piñatas! Greetings High Sec Miltiia Members! There has been a recent upsurge in new gank toons and new multiboxed gank fleets. Aside from the Kusions and Rozei clan in Uedama, there now is the "Tornado Girls" tornado girl 01thru 10 of the Cohenberg's Ethical Hauling corp, and a mixed name gank fleet of Maidens of the New Order . Exercise caution, the alts of Trump will attack you. We will need to see what we can do to rise to this new challenge. I will be away for the next few days, but have the mobile app for email. "I would love to become one, but my place is in the kitchen." The outright misogyny that Jamey and his CHODE. slaves encourage/support is downright disgusting. And here come the SJWs to save the day! Found video footage of Anon 7:40. They failed for the last 5 years daily, what hope have they got now. Nobody factors in anything they do. The best they can muster is a concord whoremail and a few burnt modules. Like a flock of seagulls at the smelly beach fighting each other for the cold hard chip at the garbage bin of uedama.